Great gifts that won't break the bank!! Width at Cutting Surface: 0.50"
Engineered to last a lifetime. 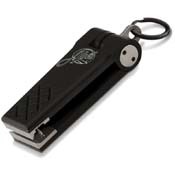 A 3 year warranty on replacement jaws, and only $10 after that, makes these nippers the last you'll aver need to buy. Note: Custom colors will take longer to ship. Please call for time estimate. 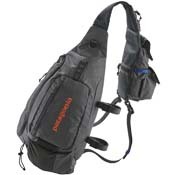 The best of a traditional fishing vest combined with a minimalist sling pack. 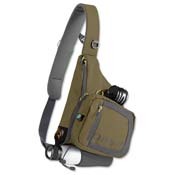 The most comfortable, durable, and design rich sling available. 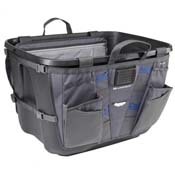 Dimensions - 2 lbs - 13" x 8.5" x 9"
Inspired by our own Brian Schmidt who stores his boots and waders in a simple plastic tub/tote in the back of his car, the Tailgater ZS turns any plastic tub into the perfect fly-fishing base camp. 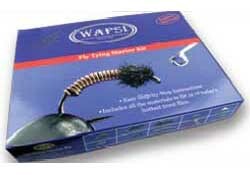 Dimensions - 15" x 10"
9" x 5" x 15 3/4"
Designed to give the starter positive results the first time he ties a fly. The kit includes all of the necessary tools (and vise) and materials to tie 10 of today's best trout flies. The new DVD gives clear, step-by-step instructions on how to tie each fly. 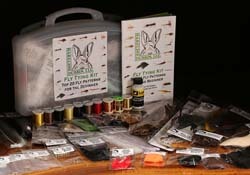 48 different materials make this fly tying kit the ultimate for a beginner tier. 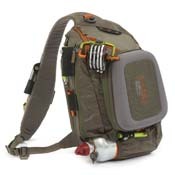 All premium materials, hooks, and Veevus threads. 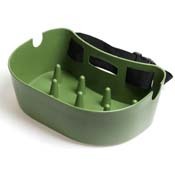 Lets buyers assemble their own vise and tool selection. INcludes a 60 page - 20 fly pattern book with step by step instructions. 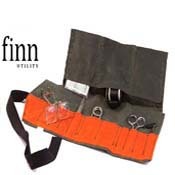 The Finn Tying Roll is perfect for heading over to a friend's house while safely transporting your tying tools along with some hooks. 4 in. x 6.5 in. (closed dimension). New from across the Atlantic! 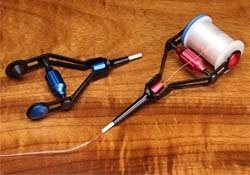 Midge bobbin in Blue, or standard in Red. 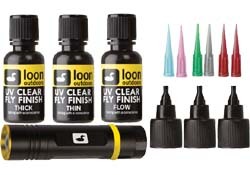 With everything a tyer needs to make the move from traditional cements to UV Cure, the UV Fly Tying Kit includes UV Clear Fly Finish - Thick, UV Fly Finish - Thin, UV Fly Finish - Flow, Assorted tips & Brushes, and a UV Bench Light.